Indian Culture is so diverse that even Indians do not know of all the customs of India. With growing modernization, it has become more difficult for the increasingly small families to keep in touch with the tradition and culture of their forefathers. They are unawaere of their customs. Sikkim is a small, hilly Indian state bordering Nepal, China and Bhutan. This state has marvelous natural heritage and rich in enthralling cultural tradition. Sikkim is geographically diverse, due to its location on the Himalaya. Its climate ranges from subtropical to high alpine. Sikkim is a famous for tourists because of its culture, scenic beauty and biodiversity. People can view Kangchenjunga, the world's third highest peak, from most parts of the state. In Sikkim large number of Nepali, Bhutia and Lepcha speaking group of people reside. 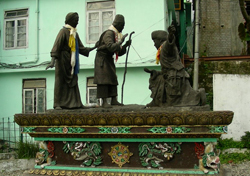 Historically Buddhist saint Guru Rinpoche came to Sikkim through the land in the 8th century. He introduced Buddhism to Sikkim, and predicted the era of dominion in the state that would arrive centuries later. In the fourteenth century a prince from Eastern Tibet, had a heavenly revelation one night instructing him to travel south to seek his fortunes. His children later formed the royal family of Sikkim. In 1642, the fifth generation successors of Khye Bumsa, Phuntsog Namgyal, was the first king of Sikkim,marking the beginning of the realm. In 1700, Sikkim was assaulted by the Bhutanese with the help of the half-sister of the king, who had been denied the throne. The Bhutanese were motivated away by the Tibetans, who restored the throne to the king ten years later. 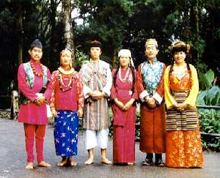 The first known people to occupy Sikkim are the Lepcha and anything before that is obscure came to Sikkim from the east in company with Jindaxs, who went to Nepal and shared their tradition. The Lepchas were a very amiable people, extremely religious and introverted. In the period of the British Raj in neighbouring India, Sikkim associated with them against their common opponent, Nepal. The Nepalese attacked Sikkim, and defeated it. This prompted the British East India Company to attack Nepal, resulting in the Gurkha War of 1814. Steadily the association between Sikkim and the British administrators of India grew bitter. In 1849 two British doctors, who were in charge of relations between the British and Sikkim Government, ventured into the mountains of Sikkim unexpected and they were detained by the Sikkim government which lead to a British expedition against the Himalayan kingdom, after which the Darjeeling district and Morang(one of the 75 districts of Nepal) were annexed to India in 1835. In 1947 Sikkim was prohibited from joining the Indian Union and Prime Minister Jawaharlal Nehru agreed to provide a special territory status for Sikkim. Sikkim was to be a tributary of India, in which India controlled its external defense, diplomacy and communication. On May 16, 1975, Sikkim formally became the 22nd state of the Indian Union. In Sikkim, there are no airports or railheads because of its rough terrain. The nearby airport, Bagdogra Airport, is near the town of Siliguri, West Bengal. The airport is about 124 km away from Gangtok. The Gangtok helipad is the only civilian helipad in the state. The adjoining railway station is New Jalpaiguri which is located sixteen kilometres from Siliguri. National Highway 31A links Siliguri to Gangtok. Numerous public and private bus and jeep services connect the airport, railway station, and Siliguri to Gangtok. There are many festivals celebrated by people of Sikkim. Kagyed Dance is post-harvest masked-dance festival to ward off sin and bring good fortune in the coming year: The dance (chaam), symbolizing the conquest of good over evil which is performed at the Tsuk-La-Khang, Phodong and Rumtek monasteries. The New Year of Sikkim populace is celebrated in the end of the harvest season with great feasting at home. Another big traditional ceremony is Maghe Sankranti, Hindu festival observes the passing of intense winter days and to welcome spring. Jorethang Mela' and other flairs are organized at this occasion. On the first day, religious Hindus take a ritual bath at these holy spots. Losar is more respected by the Sikkim society. Bumchu is held at the Tashiding Monastery in West Sikkim. This festival is for two days that occurs a fortnight after Losar where the abbot of the monastery unveils a pot of saintly water that will predict luck of sikkim people for the year ahead. Flower Festivals are celebrated to invite worldwide visitors to observe Sikkim's wealthy floral resources commemorated with a flower show at the White Hall. Saga Dawa is devout tradition also called the 'Thrice Blessed Day'. Sikkim people believe that the Buddha's soul entered his mother's womb, and as an adult he attained enlightenment and passed onto nirvana on this day. This is a day of spiritual keenness for Buddhists. Guru Rimpoche Trungkar Tshechu is holy ceremony. On this auspicious occasion, Sikkimese Buddhists give respect to the master who first blessed Sikkim as sacred land, Guru Rimpoche. 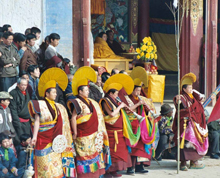 A great dance drama is performed at the Rumtek Monastery enacting the eight manifestations of Guru Padmasambhava, the Indian sage who was responsible for consolidating Buddhism in Tibet. 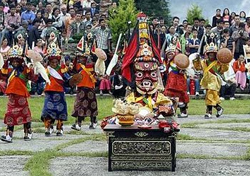 Tendong Lho Rum Faat is lepcha festival observed by the Lepchas to pay obeisance to the Tendong Hill which saved their tribe from extermination in the great flood. Pang Lhabsol is exclusive festival for Sikkim people. In this festival, the snowy range of Khangchendzonga is worshipped for its unifying powers. It is celebrated with great enthusiasm by signing of the treaty of blood brotherhood between the Lepchas and Bhutias by Khye Bumsa and Tetong Tek when the local deities were invoked to observe the occasion. Dasain is considered as most important fiesta of the Hindu Nepalese residing in Sikkim. This denotes the triumph of good over evil. The elders of the family bless the young with 'tika' and gratuities. Tihar is known as Diwali and celebrated similarly as it is celebrated in other parts of India. Above are some of great festivals in Sikkim. Other facts about Sikkim are that the southern urban areas have English, Nepali and Hindi dailies. Nepali language newspapers are locally printed, whereas Hindi and English newspapers are printed in Siliguri. The regional people still follow some strict rules and codes regarding their clothing. Women are not allowed to wear western dresses. Men should be dressed in full pants and full-sleeved shirts. Warm pullovers or jackets are required throughout the season of autumn and early spring. In hilly areas, when the sun appears, it shines brilliantly. It is advised to wear body-covered dresses to avoid tan and skin problems. Tourists and newcomers are advised to use sunglasses, sun hat. As far as literacy is concerned, Sikkim has 78 per cent literacy rate. The good part of this state education is that in government schools, students do not pay tuition fees and receive textbooks and exercise books free; uniforms are distributed free up to Class V. As a further incentive the government gives liberal scholarships and other grants. Though good progress in education during the last decade is reported, there are continuing problems such as lack of access to schooling and a low level of school completion. Due to these consistent problems, achievement levels lower than children of this state could have been. Sikkim is also a good place for adventure-sport lovers. It is one of the beautiful states of India where number of adventure sports are played. 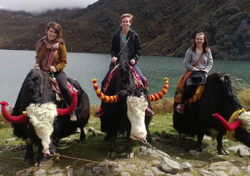 The main attractions of sikkim are: Mountaineering, Trekking River rafting, Yak safari, Mountain biking, Hang gliding. People of Sikkim have inborn exceptional skill for craft making. From centuries, craft items of Sikkim enhance economic condition of India. There are different communities in Sikkim and almost all have expertise in at least one handicraft item. Sikkimese uses traditional method of production to make craft items. Sikkim is modernizing but the people of Sikkim prefer to live in traditional way because it is more cheap, better quality and way more rewarding. Woolen Carpet, one of the marvelous craft item is the most famous offering to come out of Sikkim. Another attractive craft item which represents the skill of Sikkimese people is wood carving of the many monasteries in Sikkim. The wood in the monasteries are engrossed with symbols and icons from Buddhism. Thangka Paintings were and still are an item of reverence among the people of Sikkim. Thangkas are generally made on cotton canvas with vegetable dyes as colors. Handicraft products from Sikkim are also gaining appreciation and praise around the world. Sikkim also attracts visitors for its tourist places and nice life style of people. There are many places of tourist interest. Sikkim is center of attraction of tourists for its best natural scenic beauty. Tourists are often enthralled by the grandiose view of the snowcapped mountains, lakes, wild animals, Monastery, and many more tourist attractions. A bird eye view also attracts tourists to visit Sikkim. Note: The information is just for awareness.